A few weeks ago we visited Disneyland and Disney California Adventure Park to enjoy the annual Halloween Time. Every year Disneyland and Disney California Adventure Park put on a spooktacular display of decor, festive treats and other surprises for everyone to enjoy. It is by far my most favorite time to visit Disneyland! I shared a ton on social media about our recent visit which you can still see on my Instagram Highlight labeled Disney with the Jack-o-Lantern emoji. I also asked you guys to send me any questions you may have regarding Halloween Time at Disneyland. I took screen shots of your questions and have decided to answer them here. If you don’t see your question below or have any others, leave them in the comment section below and I’ll answer them there. You can also learn a ton more about Halloween Time at Disneyland and Disney California Adventure here. The most popular spot for Halloween Time family photos is in front of the giant Mickey Mouse pumpkin which is inside Disneyland! It is so cute and right at the entrance to Main Street, you won’t miss it. You may have to wait in line. I’d try and get to the park when it opens and snag your photos first thing. Q. What is the best Halloween Time treat? A. There are a TON of Halloween Time treats available at both parks! We are partial to the churros and cake pops though. This year there are over five different churro treats for Halloween Time, some include; pumpkin spice churro, a churro ice cream sundae and an orange sugar churro. Our favorite Halloween Time churro though is the Sour Apple churro with warm caramel dipping sauce. Be sure to grab a Halloween Time Food Guide which will detail all the various treats available and where to find them. You can find the Halloween Time Food Guide at any Guest Relations areas through out both parks. Q. How do you handle the crowds with a toddler? A. I think this varies as it depends on the child and what they can handle. I know with my own toddler we can not wait in a line that is longer than 35 minutes. I swear by the Disneyland app and check wait times through out the day. Any wait times longer than 35 minutes we skip or use a Fast Pass for. I have MaxPass on my Disneyland app (which I’d 100% recommend) and that allows me to snag Fast Passes right on my phone quickly. If you don’t have MaxPass you can get it for the day on the Disneyland app. MaxPass has a ton of great offers but the best being you can grab Fast Passes though out the day FAST! I also like to time meal times with parade wait times. For example when we wait for a parade we will also eat lunch or an early dinner. This keeps my toddler entertained while waiting for the parade. Naps are hit or miss for us. Sometimes she naps in her stroller and sometimes she doesn’t. If she does nap I’ll grab a snack or just sit and people watch in the shade. Sometimes she naps while waiting for a parade and then I just feel lucky. We go pretty often so my toddler is used to the park, sleeping on the move and waiting in (short) lines. I bring a ton of snacks from home and our water bottles we keep with us while we waiting in line. 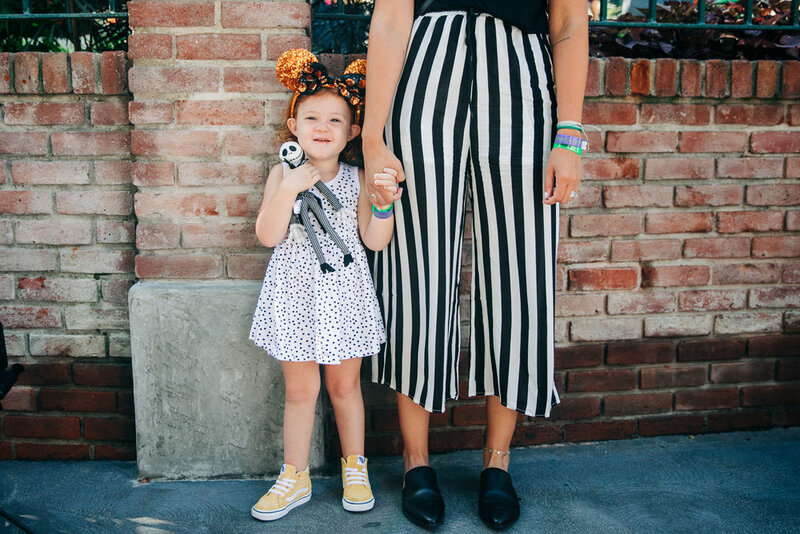 I wrote a post HERE about our top three Disney Tips, but for the most part I follow my toddler’s lead. There are festive treats in every corner of both parks! We love the Halloween Time cake pops (and the churros) the best! How cute are these? Almost too cute to eat! The green poison apple one is chocolate cake and Jack Skellington is vanilla cake. You can also see the cast members making the yummy treats in person! We also love taking a few minutes to watch them decorate. Q. How do you book breakfast with characters? Where is it located? A. You can book Character Dining either online or on your Disneyland app. Our two favorite places to dine with characters is either at Goofy’s Kitchen located at the Disneyland Hotel or at Storytellers Cafe’ at the Grand Californian Hotel. There is also character dining at the Paradise Pier hotel and inside Disneyland at the Plaza Inn. You can learn more about character dining here. Q. Is it really expensive? It is hard for an average family to afford, what are you tips/secrets? A. I won’t lie to you, Disneyland is pricey, especially if you have a large family. My family has annual passes which we pay for monthly. We visit the parks enough to make it worth our while. I love Disneyland during Halloween Time the most, but it is also incredible all year around. To save money, try and visit the parks during non-peak times. You can purchase your tickets online ahead of time so it could be helpful to buy tickets little by little prior to the date you plan on visiting the parks. I’d also plan to use MaxPass so you can maximize your time at the parks. Typically when we visit we try and make a list of a few things that are ‘must-sees’ for us. So we make sure to hit those things and then everything else in between feel like a plus. You can also bring in snacks and a foods from home to save on buying everything inside of the parks. We bring our own healthy snacks and water bottles into the park so we don’t have to buy those. Planning ahead goes a long way. Do your research and buy what you can ahead of time. Make a ‘must-see/do’ list. Enlist in MaxPass. There is also a Baby Center in both parks. In there you’ll find nursing areas, changing tables, toddler toilets and a kitchen area with a microwave and sink. If you’ve forgotten anything like; diapers, wipes, bottles, pacifiers, baby food or formula, you can purchase those items in the Baby Center. 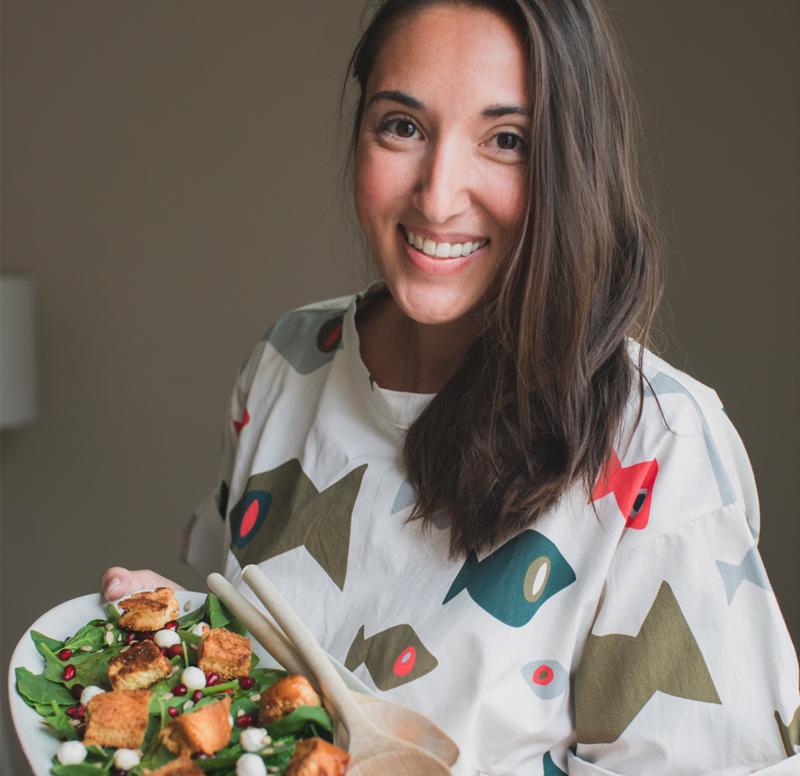 To save on money I like to bring food that I can simply warm up in the microwave. (Those mac and cheese cups specifically I always stash in my stroller) You’ll be spending money, yes. Is it worth it? I for sure think so! Do and spend what you are comfortable with and make the most of your experience. Disneyland is magical no matter how you spend your time there. Don’t feel like you have to do everything on the map, curate your day to fit your family! Q. What day is the best to visit? A. This varies and depends on the season. I’ve always have the best luck on low crowd levels Monday-Wednesday. Though a lot of the fun nighttime entertainment happens on the weekends. We like to get to the park before it opens to beat the morning crowds. By doing this we are able to ride a lot of the Fantasy Land attractions before the lines get too long. If we want to visit for an evening show or parade then we get to the parks later in the day and use Fast Passes to ride attractions. Then plan to eat dinner while we wait for the evening show. Whatever day you plan to visit, check ahead of time to see what parades and shows are showing. Plan to arrive before open to ride attractions with low wait times and plan to eat meals during parade or show times. Q. What is a good game plan to beat lines? Especially Space Mountain and Haunted Mansion? A. Definitely use Fast Passes and if you can, use the MaxPass via the Disneyland app. I’d snag Fast Passes for popular attractions earlier in the day because they sometimes run out come the afternoon. Try and arrive to the park before it opens so you can be among the first to enter. This will ensure low wait times for attractions for a good portion of the morning. Take a loon on the Disneyland website and check park open and close times! If you are staying at a Disneyland resort then take advantage of their Magic Morning which gets you into a specific park an hour before it opens to the public. If you can’t do Magic Morning, then plan on going to the park that doesn’t have Magic Morning going on that day. Q. What are some Halloween Time MUST-SEES? A. 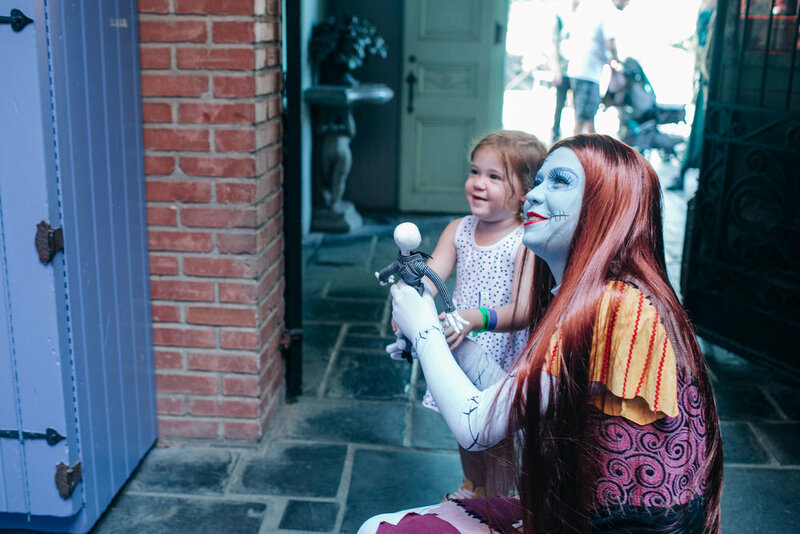 The Haunted Mansion Holiday attraction is our favorite as well as the Jack and Sally meet and greet. 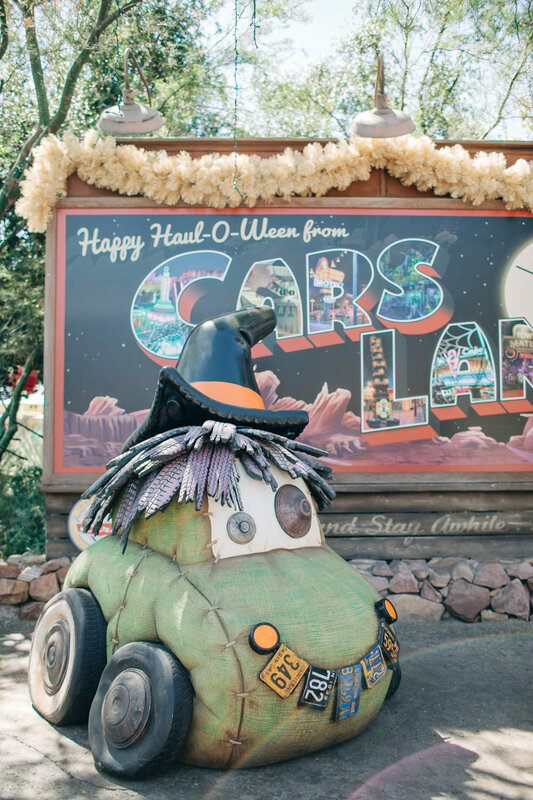 Cars Land is the absolute BEST during Halloween Time and is a great place for the whole family and for photos. The Headless Horseman inside Disney California Adventure is pretty neat, especially at night time! 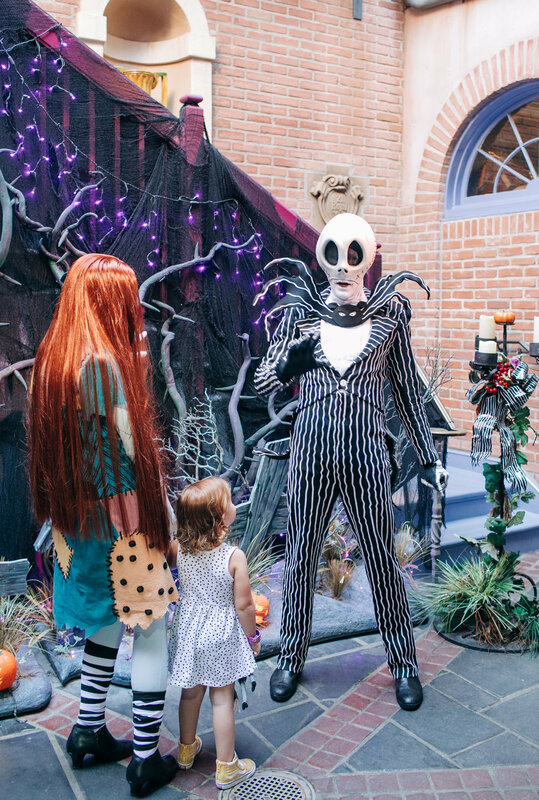 The Jack and Sally meet and greet in New Orleans Square is a MUST if you are fans of The Nightmare Before Christmas! We love this movie and meeting the main characters was such a highlight. We’ll definitely go say “Hi” to them a few more times before the holidays are over. Q. What age is most appropriate to start bringing kids to Halloween Time at Disneyland? A. I think Halloween Time at Disneyland is perfect for toddlers and up! Halloween Time is a great balance between spooky and silly. Your toddlers can experience the majority of what Halloween Time offers! Something new this year is the Vampirina meet and great which my toddler was head over heels for. 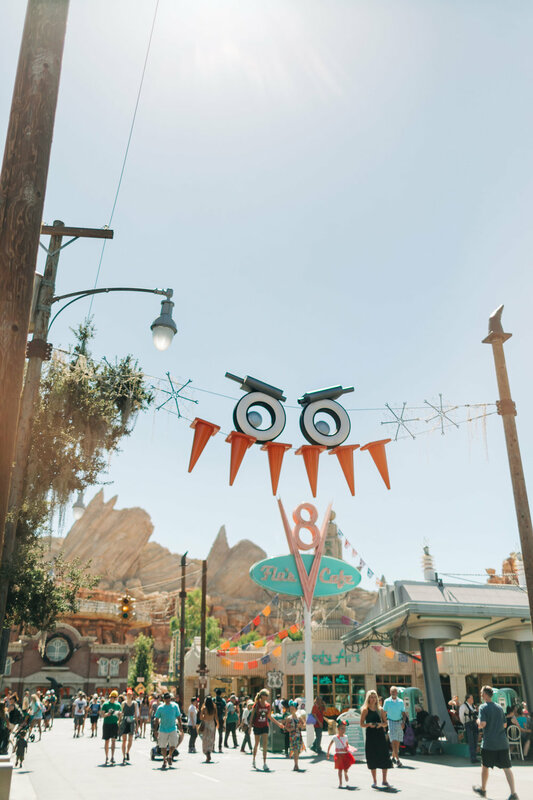 Cars Land is the BEST for toddlers during this time everything from the attractions to the decor is so cute and filled with Halloween Time fun. 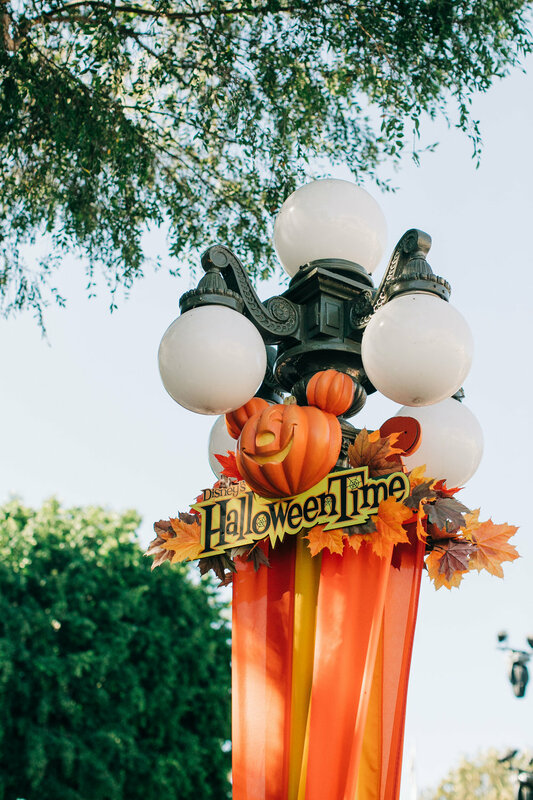 You can learn more about exactly what Halloween Time at Disneyland offers here. Q. Where can we get the Mummy Mickey Macaron? A. This Mickey Mummy Macaron is SO YUMMY! You can find it at the Jolly Holiday Bakery Cafe’ in Disneyland. Q. Do they have anything Coco/Day of the Dead related? A. YES! They have an entire Coco area and the cutest Coco music show that plays a few times a day over in the Disney California Adventure Park. Inside Disneyland they have a Day of the Dead area set up in Frontierland. Both are beautiful and offer crafts and other fun things for little ones to enjoy! Q. How do you keep little ones from being afraid of villains? A. This totally depends on the child. I think some kids are into it, some are Ok with it and some are NOT ok with it. You know your little one best and if something bugs them or makes them uncomfortable then just skip it. Luckily, Halloween Time at Disneyland and Disney California Adventure Park is more about Halloween fun than spooks. Our family has always been into Halloween and my daughter who is two has always been interested. If she were showing signs of being a afraid I’d talk to her and assure her the spooky things are pretend and meant to be fun. If she were really bothered by it, we’d skip it until she felt ready. Follow your toddler’s lead. Q. How long do they keep the Halloween decor up before moving into Christmas? A. Halloween Time is up until October 31st! Q. Is the Headless Horseman at Disneyland? A. The Headless Horseman statue is inside Disney California Adventure Park. It is really cool to see in person during the day but even better at night! Q. Will Jack and Sally be around through Christmas? A. As of right now it says they will only be available for meet and greets until October 31st. Below are a few more photos from our recent trip to Halloween Time at Disneyland and Disney California Adventure park. If you have any additional questions, leave them below in the comment section and I’d be happy to answer right away! Most of the Disney characters are in their Halloween Time costumes and Goofy as a skeleton is the cutest by far! Don’t forget, you can check where and when the characters will be out and about for meet and greets on the Disneyland app! Just select ‘Characters’ from the category list and their times and locations will pop up on the park map. 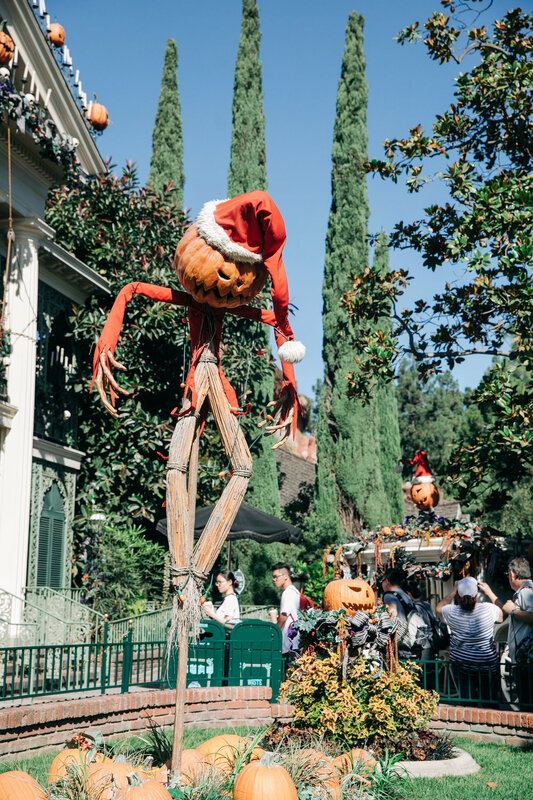 I love the Pumpkin King right at the entrance to The Haunted Mansion Holiday attraction! This attraction is THE BEST! It is by far our favorite thing to ride during Halloween time. Don’t forget to get a Fast Pass for this attraction right away. Most days the Fast Passes for this attraction will run out by late afternoon. You can get a Fast Pass by either going to the Fast Pass distribution area which is located near the attraction itself OR by using MaxPass via the Disneyland app. Dan bought her this Jack Skellington doll and it has been attached to Mila ever since! 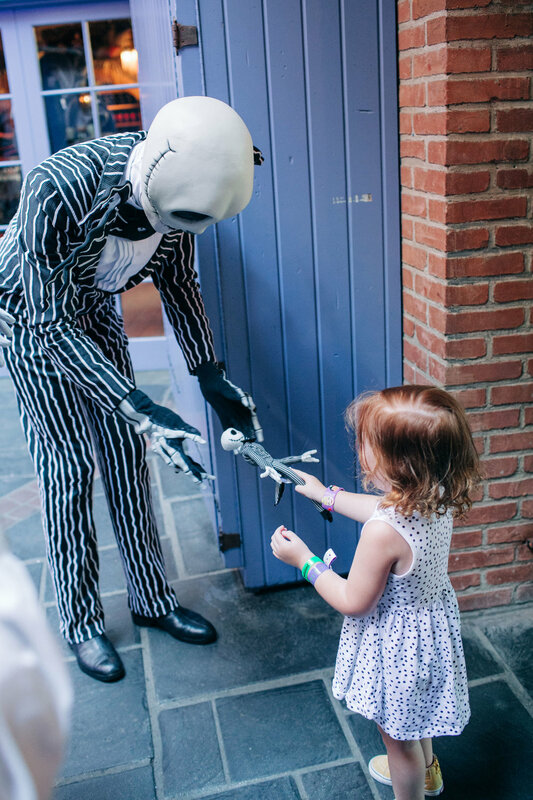 We are such big fans of Jack Skellington and the movie The Nightmare Before Christmas! They have a whole store dedicated to the movie in New Orleans Square! If you are a fan, definitely stop by and take a look! The entrance to Disney California Adventure is the best! You can even hear Oogie Boogie’s laugh as you enter the park.